I was browsing for a book on the Apollo moon landing and stumbled on this book in the Kindle Unlimited collection. I decided to give it a try and was pleasantly surprised. 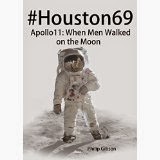 #Houston69: Apollo 11 - When Men Walked on the Moon is told from the perspective of social media. It's almost like we meet characters from the Apollo landings, the astronauts, the mission control people, media, government officials, etc. and the story of the journey from launch to splashdown is a series of tweets and posts. At first I thought it was too choppy and annoying, but I found myself getting excited in place, as we followed along the events as they occurred in real time. No distractions and side stories as happens in many books. Just a series of posts as the story unfolds. Perhaps it's because I'm of the generation using social media that it worked, but I actually enjoyed the book.